Among all of the congratulations (thank you! ), one question is popping up repeatedly. How are we going to make room for another baby? After all, our hundred-year-old bungalow is just 1400 square feet, and I run my stationery business out of it. My sweet, colorful, lovely little studio is going to move into the scary basement. I’ll miss you, studio! I’ll be honest. I’m pretty sensitive to my surroundings, so working in our unfinished basement is going to be a bit depressing. Plus I scare easily and I think my assistant Erika might too, and I can see us both being weirded out by spending time down there. It IS a little spooky, but we don’t have any other options. Eventually Brandon and I would like to put up drywall and make the lower level feel like the rest of our home, but we don’t have the budget right now. We’ll clean it up and arrange things as best we can, but I fear it will still be icky. I mentioned the basement walls in a couple of the comments below, but here is a photo. Unpaintable, bizarre crackled tiles. No ceiling either, and wires everywhere. Here’s a link to view the photo in a larger size. My studio will become Eleanor’s new room though, and that will make me happy. It’s going to be adorable! And the room (12×12) feels so much bigger than her current space (7×14 with sloped ceilings), so that will be nice for her. The nursery will stay a nursery since it works really well as such. I do plan to make at least a few changes though, regardless of gender. I want the new baby to have a look of his/her own. Now all of this puts greater urgency on #9 of my 30 Before Thirty list: Clean out the basement. All of this shuffling of space hinges on getting it ready, and I am SO not looking forward to that task. I know those feelings but you will make it lovely–you always do! Oh and Congrats to you and yours. 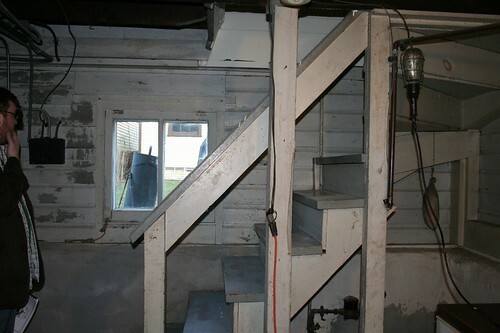 As scary as the basement kinda looks in that photo, you do have a window. That’s a good thing. With a fresh coat of paint and some curtains, it will look great! Don’t underestimate fake windows with fake scenery for basements! Really cheesy, I admit. Plants do wonders too! This is coming from a gal living in the high-latitudes! Bring the outdoors and brightness in! You are already good at that! You’ll make it~ We have a family of 5 living in 1400 sq ft..Plus, think of all the fun you’ll have creating these new spaces! i’m sure you’ll create a great basement space as well! Where did you get the great rug you have in the nursery now? That was from Crate & Barrel (orleans rug). I am thrilled for you to have 3 new rooms to create-studio, Eleanor, baby 2, and I’m convinced it will be beautiful. Sometimes working with little and in an odd space like the basement can lead to the most wonderful designs. With a little sanding and a fresh coat of (pink) paint those wall could have character. Can’t wait to see where you go with it! Oh, and congratulations! We recently painted our garage walls and ceiling bright white– it makes a huge difference and is like another room to our house now. I was hoping to do drywall too but was really thrilled with how the paint turned out. I’m sure it will be the same for your basement. Good luck! I wish we could paint. You can’t tell from the angle of that picture, but most of the basement is covered with some sort of bizarre tiles completely crackled with peeling paint. I need to get samples tested because I’m convinced they’re made of something horrible like lead or asbestos. Either way, they can’t be sanded and they can’t be painted. They need to be taken down and replaced or covered over with drywall. I can’t wait to see all of your transformations! Make sure to bug bomb the basement. That will help with the gross factor. I am doing the same thing, moving my workspace into the basement to make room for our first baby, Luckily I got my Father in Law to remodel for cheap. Good luck, I am sure you can make it bright and none scary. I am a big fan of this bug bombing idea! You will turn it into something beautiful, I just know it. yay! I can’t wait to see the new transformations in your home!! Yes, I remember following their progress. Unfortunately, I can’t even paint our walls (see my earlier comment). ah yes. i see that now- shoot! i was so hopeful you could do an easy (somewhat) fix to brighten it up. i look forward to reading about what you end up doing, because i know it will be great! Have you thought about having the kids share a room? I know I am so grateful for having had to share a room with my sisters. It’s a great bonding exp and there is nothing more precious than the sound of whispers and giggles coming from the room way past bedtime. My girls always have shared a room, and even though they have their fights, I don’t think they would have it any other way. If anything it would give you time to get the basement looking lovely with out the time pressure crunch. We have thought about having them share! My studio would still end up in the basement, but we sort of like the idea of kids sharing anyway. For now though, we’re going with the plan of studio in the basement, Eleanor in my former studio, new baby in Eleanor’s former nursery. Have you considered flat curtain panels to hide the walls? Can’t wait to see what you come up with! Yeah, curtains might be the way to go in this case. I have faith that you will make it the best basement studio it can be! Can’t wait to see the new nursery/E’s room/studio! Oh, and my craft room is about to become part of the laundry room! If you’re going to redecorate your space as a temporary solution until you renovate, maybe you could put up a wall of curtains to hide the peeling paint and tiles? Can’t wait to see what you do with Eleanor’s big girl room! That Expedit unit makes great toy and book storage, if you leave it for her. I’m sure you will make the basement look great and opearate as a functional space for the time being. I can’t wait to see what you do with it! It could be completely amazing! The space is great, definitely. It’s just… a long way away from being good right now. I can’t wait to see Eleanor’s new room and how you update the nursery. I’m glad your studio won’t be completely homeless. I’m sure it’ll be great. Ugh…how discouraging that you can’t just paint for now. I do see potencial, though! We are in the process of fixing up our unfinished basement also, on a very tight budget. Luckily, we had cinder block to paint. I love your office now, and can’t wait to see what you do in the new space! I know. Paint is such a lifesaver, I’m bummed that our walls aren’t able to take it. Your house feels much bigger than 1400 sqft from the pictures…. At least updating the basement gives you something to blog about (not that you were short on content or anything). Our house is small (compared to the average American house these days), but it has a good floor plan with lots of rooms so it feels bigger. we have a really reasonable handyman who’s done a lot of cheap drywall work in our house, message me if you want his number. Good luck with the basement, I agree with other that curtains would be the way to go for the walls until you you can do the drywall that you want. If you go with the fabric idea I would imagine that you would want to run a wire and then string the fabric on that, and if you set it out from the wall you could even hang it over the drywall if you like it. Some good lighting, a nice rug (probably sisal or something that is an indoor/outdoor rug probably would be best) and it will be workable. I feel for you! I work from home, and just moved my office upstairs after having a basement office for 12 years (my pre-teen took over the office in the walk-out basement as his bedroom). Congrats to you on your happy news! as someone who also runs my stationery business from my basement “studio” in our old home, i totally get it. we have bare pipes all over, electrical wire, etc. i feel horrible making the kids play down there while i work. in the end, it all works out though. i’m sure you’ll find a brilliant way to make it beautiful! I know… I feel bad that the kids (plural!) are going to have to play down there. Ewww! Those tiles do not look friendly at all! You poor thing! Much luck to you in this time of transition- how exciting! You could make that place SING right away with FABRIC on the walls and ceiling! I’m guessing it isn’t damp down there; otherwise, you wouldn’t even consider having your stationery down there! Yes, we’re very lucky. We don’t have any water problems to deal with down there. I bet you will eventually make the basement into something marvelous for you studio. I’m glad you have a basement and I know its going to look amazing, just a matter of time. This place is begging to made lovely. Research a great dehumidifier to combat the basement-y smells, stud out interior walls on top of that weirdo tile and drywall that. Hide all those weird wires and nasty ceiling with a drop drop ceiling (eh I know, drop ceiling but soo much more useful for access to pipes and wires, etc.) Slap a pretty floating laminate floor over Delta FL to keep the dampness and chill at bay and you’ll have an amazing space! Sorry for so many exclimation points, but we redid our fieldstone basement and love the results. We were lucky enough to have the studs, drywall and ceiling already done when we moved it, but we did the floor ourselves and it made a huge difference. Oh my goodness! This sounds like our house! We have a 1930s bungalow with two ‘real’ bedrooms (no sloped ceilings, sufficient space, closets) upstairs and a room downstairs that could be a bedroom (although, it has no closet) but we use it as an office. My stepsons have the bedrooms and my husband and I have (and will be sharing with our soon-to-arrive baby) what can only be described as a ‘nook.’ Small, no closets, sloped ceilings but beautiful windows! Sounds similar, though our nook is just leftover from the attic (the rest was expanded with dormers in the 70s). We have two “real” bedrooms upstairs, the nursery nook, and one more bedroom downstairs (my office). Congratulations! I love what you have done with the nursery! Where did you buy the side table right beside the glider?? I love it! i was reading this and about to say “the basement is on your list! !” but you know that! i know it will look great no matter what you do with it! bring in some nice lighting for those dark illinois winters! Where did you get that fabulous white rug in the basement? I think you mean the one in the nursery, right? Crate & Barrel. Can you demo the walls down to concrete and paint that? Our unfinished basement is all concrete, and painting the floor a nice dark gray and the walls a bright white made an AMAZING difference in the livability of the space. The steel beams and support posts got a fun turquoise. We also mounted some copper pipe from the ceiling and hung white curtains (sheets, actually) around the utilities to hide those. That’s an idea. I should see what’s behind those tiles. How exciting! I’m sure you will do something genius with the basement! Wow, that looks rather scarily like my basement. I’ll be interested to see what you come up with. My husband has grand plans to build a Star Wars shrine in ours. Is is possible to move your husband’s office to the library and make the office your daughter’s room? I wondered about this as well. From what I understand, you work at home and he doesn’t. Seems like that should give you priority for the office that’s upstairs. Unless your husband’s office is actually more like a “family office” and a shared space. My studio is upstairs, along with the library (stair landing area), our bedroom, and the nursery. Turning the studio into a bedroom makes the most sense so that we’re all on the second floor together. Brandon’s office is a small room off the living room that also houses all of our media. My office is in our home’s fourth bedroom, which is on the first floor. There isn’t enough room to combine it with my studio, so the basement is the best option for us. and, i’m sure that you CAN transform any space to something sweet, nice and warm. so i’m looking forward to seeing you transforming that basement. have you thought of putting some nice fabric on the most annoying of the walls? I know you said this earlier, but there is a very good chance considering the age of the house that either tiles on the wall contain asbestos, or the mastic that holds the tile to the wall does. Removing any of it can potentially release the fibers into the air so I wouldn’t touch it without having it looked at by an environmental firm. The good news is that as long as you don’t disturb it, it shouldn’t be a problem.. so for the short term covering it would be the best option. I would just take care not to drill into any of the tiles themselves. Yes, we need to have some testing before we decide what to do with the walls. Yep, I love her basement (and her blog)! I actually saved it when it was in a magazine (Real Living, I think) a little while back. I like that she has exposed ceilings, though even her raw space looks better than mine. Congratulations on your upcoming baby. As a reader of your blog – I am also excited for us “the readers” as we will get to see you transform your space in your wonderful colorful way. This is a great journey for all of us. Thanks for letting us come along for the ride. perhaps a Home Depot (sponsorship) of the project. It looks like a great space to me, just needs your attention and creative flair. I’ve got two kids in one room and a baby in our bedroom…and I plan on moving the baby into the other bedroom with the boys, if she ever starts sleeping through the night. Could you put the two kids in the bigger room and take the nursery for your studio? I was going to post something similar….or maybe, you could have the baby in a crib in your room for a while and then have the two kids share? At least until you have the time to make it not so icky down there. My guess, though, is that you will make that space look good on whatever budget you have for it. And, one last thing…maybe hang fabric on the walls until you can put dry wall up? I used the nursery briefly when we were laying bamboo flooring in the other room, and the space doesn’t work as a studio. I can’t put up shelving because of the sloped ceilings, and there isn’t enough storage space for my inventory or to set up my work stations. We are going to have the baby in our bedroom for the first few months, so that will buy us some time if we need it to get everything done. At least a few curtains can be made on a budget. I can’t wait to see the changes in the rooms! And the basement curtains only need to be like canvas dropcloths in the lightest color they have. No need buying expensive fabric for a temporary fix. I was going to suggest fabric to cover the walls as well, but I see I wasn’t the only one with that idea. The paint drop cloths is a fun way to go, and you could do all sorts of paint treatments or murals on them. It’s just another challenge, and your little creative mind loves that! You’ll make it wonderful- you always do – can’t wait to see it :). Is tenting the basement an option? Ruching fabric over the walls that won’t make good surfaces for painting? Lady, you’ve had 4 square walls to work with and you’ve worked magic. Time to ramp up the difficulty a little, eh? I’m looking forward to seeing how you overcome this challenge. No doubt it’ll be creative and brilliant! I CAN SEE YOU PUTTING UP A TEMPORARY SYSTEM OF FABRIC PANELS TO COVER THOSE WALLS AND TO SOFTEN AND DE-SCARE THE SPACE….YOU ARE QUITE CREATIVE, ESPECIALLY ON A BUDGET. I CANT WAIT TO SEE WHAT YOU DO. I’m sure the basement will look amazing once you do your magic on it. Postive thoughts! It’s going to be great. Because you can do it! The room that was once my office is now a nursery, and we have a massive heap of furniture and papers waiting to be turned into our shared office. But hey, babies are wonderful and we can do it! I have one word for you: Congratulations! Oh, and two more words: white paint! I recently transformed an unfinished closet into an office, leaving everything exposed, with the help of a can of no-VOC white paint (see here: http://thewritestart.typepad.com/the_write_start/2010/06/a-closet-of-ones-own.html and here: http://thewritestart.typepad.com/the_write_start/2010/06/a-closet-take-two.html ). It’s still pretty rough, but at least it’s not quite so scary anymore! I totally understand the grimness of moving into the “dungeon”. It isn’t terribly inspiring in most basements. If your tile is the same as ours, and it looks as though it is, it is probably Transite. This was a cement/asbestos combo that was very popular at the early end of last century. It is generally not recommended that you remove it. When you bought the house, you should have gotten a written inspection report. Consult that, check for the term “Transite”, as alot of times inspectors will use that term instead of straight out “asbestos” because of the cement factor. The best thing to do in these cases, as removal is super pricey, is to seal the product. Cover it with a vapor barrier and vapor tape, then when you can afford to put up drywall, you can just drywall over and you won’t be risking airbourne particulate. Good luck Nicole! I know you’re going to make the basement gorgeous! Just wondering if you ever looked into this? I thought asbestos tiles when I saw the pic as well. Did they turn out to be asbestos and if so did you remove them (professionally done of course – called abatement or something I thought) or drywall over them? And someone else mentioned Radon. Absolutely do a test if you’re going to be down there to work. We had a high reading (our beloved house is from 1906, so we expected a few of these things) and had a Radon mitigation system installed and we have our handy dandy alarm that will announce if it goes above the average level. Ours stays at 1.4 most of the time, which is within acceptable levels. Hey, at least the basement has a window! 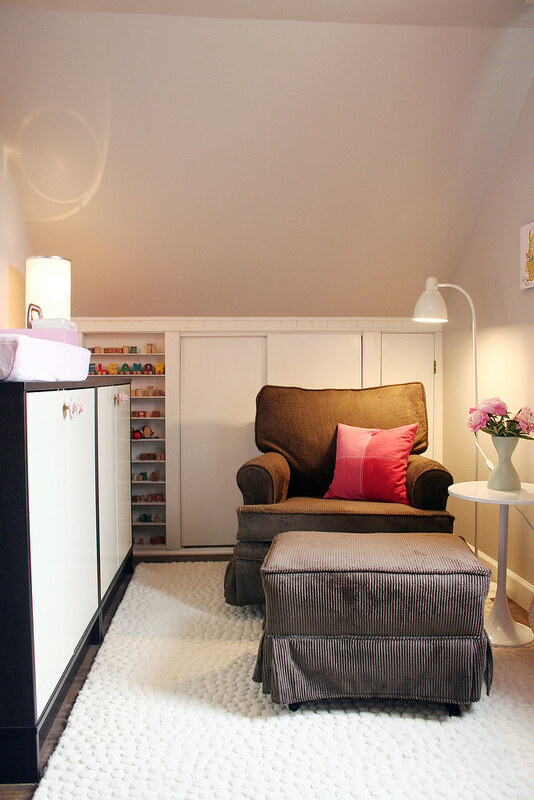 (I’m being optimistic :) ) Have you considered putting both kids in the 12×12 room and using the nursery as an office? That’s what I would do. And if you feel the need to sell the C&B rug, I’ll drive up from the city to buy it from you :) Just a thought! Good luck. As always, you’ll turn that basement into something fabulous. We have the same basement issues as you do! Lots of storage space, but also lots of concrete, wires, and the occasional creepy-crawly. Our kids use the basement as their playroom and with all of their toys and a big rug and couch, the space is functional and not too dreary. The upside is that the kids can ride their scooters downstairs in the winter and we screwed a wooden swing from Ikea right into a ceiling beam in the basement and they at least have a place to get out some energy. Although I do look longingly at some playrooms that are located in actual rooms–sigh! It will be nice to see what you can do to perk up your basement with some paint and fabric! I can see curtains gathered all around your work space (you could use cute solid color sheets and run them on wire stretched taut around the top of the wall), maybe a wooden/bamboo screen or two (these can be found cheap on Craigslist or yard sales). I bet it will be looking good in no time! Eleanor will be enjoying her new space! Ugh, I feel you on this one. I’m about to give up my rented studio space to move back home. The amount of sorting and shuffling I need to do to make this happen is overwhelming! I was just distracting myself for a bit by looking at my favorite blogs. I know you will make your new space lovely -as you always do! In the meantime happy sorting, it is nice to know I am not alone. Ps. Could you cover over the walls by screwing panels of wood over them? Plywood sheets covered with cork for a huge inspiration board, or painted with chalkboard paint as a huge chalk wall? Or even covered with fabric? The previous poster mentioned cork for the walls – that’s a great idea. At our last house (1915 bungalow, about 1300 sq ft) I had to move my office/sewing/papercraft room to the basement when the baby arrived. It was worse than yours – lower ceilings, and more…dank. The floor was gritty/degrading concrete – I put a large jute rug in my work area, then against one wall a row of freestanding cabinets with a work surface on top, and LOTS of extra lighting (including stings of white xmas lights attached to the floor joists above) – it wasn’t bad at all AND it was a bonus to have a “getaway” for myself where I could hang out and be away from the chaos of the rest of the family above! If anyone can transform the basement into a awesome new workspace, it’s you! I’m looking forward to all the new things you’ll be doing. And, congrats on the new baby BTW! I’m sure you’ll be sad to leave your pretty studio behind, but I just know you will find a way to make the basement studio even better. Looking forward to following the progress. I know what you mean about a creepy basement. But at least the walls are lighter and not scary dark stones like in my house. You should see how quickly I empty out my dryer so I can run up the stairs. Can’t wait to see pictures once the rooms are rearranged. I don’t usually do this but here is a picture of our scary basement. http://housetoyourhome.com/2009/10/26/oh-yea/. We did it on a very small budget. I was wondering, maybe you could stucco your basement walls? However you fix the problem I’m quite certain the basement won’t be scary for long! Can’t wait to see how it turns out. Can’t wait to see the new room! I notice you have the same rocker/glider in your nursery that I have…do you have any tips for getting the seat cushion to stay put? I love that chair, but that drives me nuts! long time reader, in-frequent commenter :) it made my heart smile when you said that you plan on doing little updates to the nursery for the new baby. while it’s a gorgeous nursery i love that you want to give him/her a look of their own. so awesome. oh! and if i haven’t already said it – congrat’s on the new baby! Sure you’ll make something amazing in that basement! My 4 year-old’s playroom got bumped to the basement when baby #2 was on it way. Her response, “Wait a minute, the baby gets this room and I get the basement??? ewwww…gross! !” I did my best to make it as nice as possible. I had an electrician come and light up the place to make it less dark and dingy. Good luck, I am sure you will make it look fabulous. I LOVE your studio. I don’t know where you can find imagination like that. If your 2nd baby is a girl you should totally have them share a room. I shared one with my sister until the day I moved out and it forged a really tight bond between us. That way you won’t have to work in the basement too. I can see why you find the basement a little creepy, but I’m sure you’ll make it just, well, lovely! And I’m excited to see Eleanor’s big girl room! Is she gonna have a big girl bed? You are so talented, I can’t wait to see what you do with the basement. My husband and I both work from home so we use our living room as a combined office/work/entertainment space. We spend a lot more time working than watching tv so giving priority to work space rather than the most decorative of entertainment spaces works awesome for us. Just a thought, maybe your living room could work like that for you. I’ve never seen anything like those tile things on your basement walls. They look kind of cushy, are they soft or hard? Could you staple into them? It looks like you could at least screw something into them. Maybe you could put some kind of wallpaper or fabric over the walls in an unconventional way. I imagine even stapling up fabric would look better than those tiles. Otherwise I’d cover the walls with curtains. Your nursery is really OH-so perfect, I am really glad you plan to leave it as such. And Eleanor will now have her big-sister bedroom how exciting for her!!! I have every confidence in y’all that the two of you will make it work. You’ve done such amazing things in your house already. You’ll figure something out. I can’t wait to see the transformation! It will be beautiful I’m sure, and I look forward to shamelessly using your decorating ideas as we plan for a new house ourselves. Where did you get your big wall scissors in your studio? And your bookcases… did those come from IKEA? I’m making plans for my sewing space in our new home! Best of luck to your growing family. Oh Nicole, I feel for you. I wouldn’t know where to start with those walls. PS: Thanks for your sweet comment above! Congratulations on baby number two! I am anxious to see what you do with your basement, as we had to move an office to ours when baby Fred arrived in January. But we have stone crumbly walls (sometimes leaky) and are not quite sure what to do that won’t cost a fortune. It is basically a dungeon with a washer and dryer. 2. consolidate your living-room and dining-room in one room and move your studio to the remaining space? And also: I wonder why didn’t you use your reward points to remodel the basement, since your bedroom was perfect already. Some thoughts on the basement ( I once had to make an unfinished basement livable as a playroom). First, have you thought about hanging fabric over the walls. I just read that designers guild is doing a line for Ikea). Second painting the floor can do wonders. I hate basements at the best of times so I would be devastated to move into mine! Having said that I would do as others have suggested and first cover the tiles with the vapour barrier etc then instead of drywall I would use beadboard panelling! It comes in sheets, can be painted a beautiful white (some come pre-primed) and goes up easily. I would also paint my cement floor in a rug pattern (like you’ve done before!) and have a sisal outdoor rug for underfoot. Anyhoo I know you will make it lovely, LOL! I’m sure you’ve probably seen this B&A, but the sheet/ceiling idea is great for brightening up the space, and making it less dungeon-y (I have a flooding dungeon). Also, is drywall particularly expensive in Chicago? It’s very cheap in VA. It seems almost criminal that you will have to work down there! You need light, bright, happy….lovely! Do you have air flow down there? I’m sure over time you could make it look fabulous. In my last house (over 100 years old), my office had to be in the basement, which was similar to the one you have. After much thought and struggle, my husband got out a paint sprayer and sprayed the entire thing white. 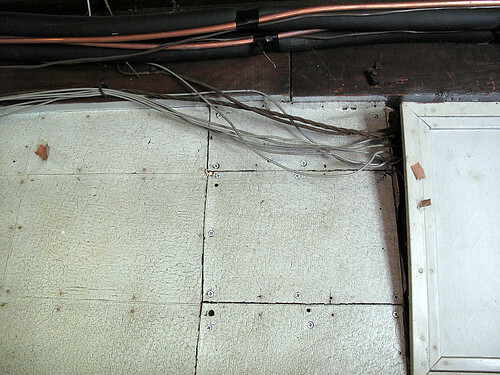 The vents, the ceiling tiles, the rafters, the wires, the walls, and the floor. Just having it painted white was enough for me to feel more relaxed in there. Good luck!! Second, don’t worry, the basement will work out fine. It’s not a subterranean basement because it has that great window. First I’d suggest painting your steps a cheerful color. I painted mine blue green, because that’s my favorite color. You could also hang some inexpensive sheets or bamboo screens in some areas. And your big bookcase will hide a lot. I put woven plastic rugs from Pier 1 in my basement. They are great on a cement floor. Good luck! Lots to do. Have you noticed that you always seem to tackle large redo projects while you’re massively pregnant! Good luck with the basement repurpose and congrats on the new progeny in under construction now! I’m absolutely in love with the rug you have in Eleanor’s nursery. I’ve been looking for something exactly like it! Could you tell me where you found it? why does the baby need it’s own room. it’s good for kids to share a room. my best friend had a baby girl when her son was 3 and the kids have always shared a room even though there were other rooms open in the home. teaches them to share space and they have each other at night. plus you wouldn’t have to go to the scary basement…. Wow…I am sure someone has already covered this ( or you have already thought of it) but, I was just wondering if it would be possible to tack up beautiful wrapping paper on some of the tiles? To carve out a little niche for you & your assistant? I know if anyone can make this space cheerful & happier, you can. I am happy to see it looks like you have some somewhat biggish windows down there? Good luck!